In a previous article, our professional team explained the reasons why your business needs a video surveillance system installed. Security cameras are an excellent investment for businesses that are looking to reduce theft, protect employees and customers, improve customer satisfaction and more. Many business owners have, at one point, considered having a surveillance system installed. Some may resort to dummy cameras (not recommended) or even security guards (also not recommended), assuming security cameras are too expensive. While they may seem like a big investment up front, a commercial security system will actually save you money and give you peace of mind in the long run. Our team also proudly offers an excellent lease to own program so that you can have a system installed today, even if purchasing a full security system is not in your budget right now. 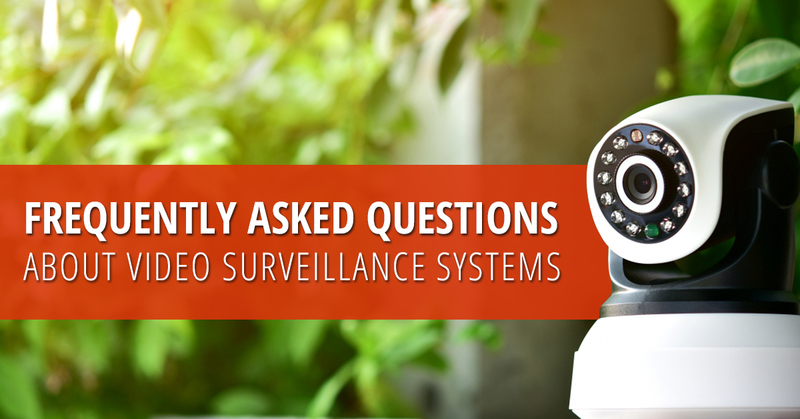 Continue reading below to learn more about video surveillance systems. Can security cameras be hacked? The short answer is, yes, security cameras can be hacked. There are two different ways a hacker can gain control of a video feed: locally and remotely. In both cases, hackers find a way to access your wireless network including your login credentials. When this kind of information is obtained, hackers have full access to gain control of your video feed. But this doesn’t mean you have to worry about your security system being hacked—there are many precautions you can take to ensure you don’t fall victim to to a data breach and full-system hack. Where should I install my security cameras? Anywhere, really! You, as a business owner, know which areas in your business or on your ranch are considered “high traffic areas.” When making this decision, ask yourself questions like, has your property ever experienced theft or break-in? Where did the thief gain access to your business? What are the most vulnerable spots on your property? While our team at Visual Security LLC can (and will!) install your security cameras just about anywhere you would like, here are a few locations and tips we highly recommend when choosing where to place your cameras. And, of course, we’re not going to leave you on your own to install your new surveillance system! Our team of professionals will install your cameras with the utmost care and precision. This is just a general guide to get you thinking about where your property would best benefits from having cameras installed. This may seem like an obvious location, but it is also the most important! To run a profitable and safe business, you need to have a record of everyone who is entering and exiting your property on a daily basis—this is essential during the day but especially at night when no one, except your security system, has “eyes” on your business. If you work on a construction site, a properly placed camera can protect all of your tools and supplies, while a rancher can keep an eye on her crops and animals at three in the morning. At child day care centers, staff members can ensure kids are always being picked up by the proper parent or guardian with cameras that are installed focusing on points of entry. This a given if you own a ranch, greenhouse or are working on an outdoor construction site. If your business is based indoors, having security cameras installed outside is almost as important as having cameras installed inside. Focusing cameras on outdoor entrances to doors windows and toward the parking lot is going to prove extremely beneficial in case of intrusion—you may be able to record specific pieces of evidence, like vehicle make and model or license plate number, that will help the police catch the assailant. Obscured entrances are ideal for thieves attempting to enter or steal from your property. Off-street windows and side doors provide the perfect amount of coverage for someone attempting to break into your business. With security cameras focused on these vulnerable spots, you won’t have to worry about someone using the shadows to their advantage. And don’t overlook windows that are high up and seemingly impossible to enter. With the right tools and proper motivation, a burglar will be able to get into these hard to reach spots. Having your cameras installed in locations that are properly lit is paramount when it comes to getting the best and most accurate recordings from your surveillance system. For example, an outdoor security camera pointing directly at the sun will cause bright stripes in the image, obscuring your view and the recorded footage. Even installing a night vision camera too close to an outdoor light will distort the picture, impairing your system’s ability to properly record your property. It may seem like a good idea to install one camera up high in a location that overlooks your entire property. The truth is, there is little benefit to having a single camera installed up high. The main reasons being, you will miss out on a detailed recording of the people who are breaking in. Descriptors like facial features, hair color and other helpful information will be lost with a camera that is positioned too high up. It is better to have multiple cameras installed rather than one that appears to cover the entire property. This is another decision that is completely up to you and the needs of your business. When it comes to the security of your business and employees, though, we always say, “The more the merrier!” Of course, the more cameras you have installed, the greater your range of view will be. At Visual Security LLC, we offer both four and eight camera solutions for your commercial business. When you decide to enlist our professional security camera installation services, we perform free property surveys to help you choose and customize the system that is perfect for your business. We will make recommendations for which system and how many cameras we believe will be most beneficial for you. Can’t I just use dummy cameras? A dummy camera is a cheap alternative to a real, high-quality security system. It terms of protecting your business and your employees, a dummy camera will do absolutely nothing—it will only provide you with a false sense of security. For many criminals, dummy cameras are easily identifiable, so all it takes it a brief casing of the joint for a lawbreaker to know that your business is an easy target. Basically, dummy cameras are a waste of your time and money. If money is the main influencer as to why you are considering a dummy camera rather than a real surveillance system, consider our lease to own program. Under the program, camera systems start at $25 per camera, per month with a minimum four-camera system. You choose the duration of the lease, and we maintain all of the equipment during that time. It’s a win win! Can security cameras see in the dark? When you decide to team up with Visual Security LLC, you can rest assured you are purchasing the highest quality surveillance cameras in Colorado. Each of our systems is ordered with your specific needs in mind, meaning you will never have to order a “cookie cutter” system that is one size fits all. Not every venue is the same, so why should your security systems be? We provide a number of surveillance cameras for you to choose from, and our night vision cameras feature a viewing range of 216 feet, depending on the ambient light in your location. If you would like that viewing range extended, we can add infrared illuminators upon installation. Why should I team with Visual Security LLC? At Visual Security LLC, we offer the highest quality surveillance systems in Colorado. All of the systems we offer and install are fully customizable so that you can choose all the features you want without having to include any options that you find unnecessary. Our commercial security systems are ideal for ranches and greenhouses, child day care centers and construction sites. We also proudly offer our services to all local businesses including hotels, gas stations, underground parking, office buildings, schools, malls, banks, TV stations and more! If you are ready to take advantage of your free property survey or want to learn more about our professional products and services, get in touch with us today!